Lost in Bryan, TX, in El Camino Estates subdivision (Conquistador Circle). Cross streets Sandy Point Road and OSR. 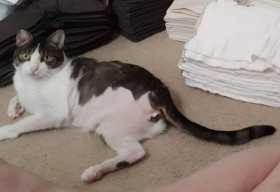 3-legged neutered cat, grey/white tabby, missing rear left leg. Super friendly. No collar, but is microchipped.